A news blackout imposed by Allied Forces prevented Americans from hearing about Japan's kamikaze operations until April 1945, six months after the start of suicide attacks. The Fleet That Came to Stay, released in July 1945 (Basinger 1986, 293), was the first American documentary film about Japan's kamikaze attacks. This 21-minute documentary features dramatic combat photography by the U.S. Navy, U.S. Marine Corps, and U.S. Coast Guard, but the script lacks specific historical details. 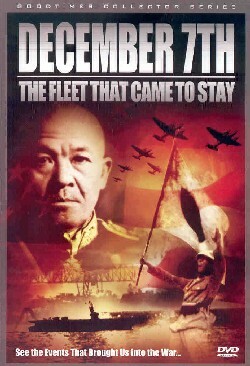 The DVD also includes December 7th (37 minutes), John Ford's documentary on the Japanese invasion of Pearl Harbor. This film won the 1943 Academy Award for Best Documentary Short Subject, but its staged scenes seem quite inferior in comparison to today's standards of filmmaking. The Fleet That Came to Stay covers the three-month Battle of Okinawa beginning on April 1, 1945. The documentary highlights attacks by Japanese suicide planes but only briefly describes the land battle. The Japanese military previously made extensive use of kamikaze planes in the Philippines from October 1944 to January 1945, but the film does not mention this. The narration has few specific details, such as ship names and geographical locations. This film gives no reasons for the Japanese use of suicide attacks, and it describes them only in general terms. "It was a maniacal, all-out effort to smash our sea power, isolate our troops on Okinawa. It was desperation. It was suicide" . "It was weird. It was savage" . The narrator summarizes the kamikaze attacks as "a struggle between men who want to die and men who fight to live"  without discussing the motivations of the suicide pilots. The documentary provides a few summary statistics. For example, only ten percent of Japanese planes got through the American air patrol during the three months of the Battle of Okinawa. Over 4,200 Japanese planes were downed, but this figure includes both kamikaze and conventional aircraft. The U.S. Navy suffered about 10,000 total casualties during the battle. The film clips show many kamikaze planes both hitting ships and crashing into the sea. This collection of clips in The Fleet That Came to Stay surpasses or equals the quality found in subsequent documentaries, since later films generally use the same U.S. Navy pictures found in this 1945 work. However, this original kamikaze documentary and also subsequent ones do not specifically identify the clips with dates, places, and ship names. This documentary is interesting from a historical perspective since it was the first one about kamikaze attacks and was produced before the end of the war. However, viewers will find little historical information, but the dramatic film clips of both successful and unsuccessful suicide attacks make it worth watching. 1. From 46:25 to 46:30 in DVD. 2. At 51:30 in DVD. 3. At 46:40 in DVD.